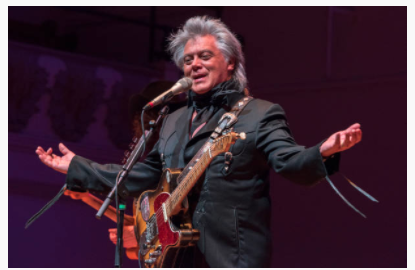 Marty Stuart and his Fabulous Superlatives are the personification of country music. Marty Stuart, 59, has been entwined in the history of country music since the late sixties – as he explained at last nights Cadogan Hall concert, he had been playing in Lester Flatt’s band since he was fourteen, and that, alongside playing with Johnny Cash, were the ‘only two jobs [he’s] ever had.’ There is a history woven into his performance, that few, if any, remaining artists can match. He has such a love of country music that just exudes from his each and every move onstage. The band started off the night with the classic ‘Stop the World and Let Me Off,’ and they played an assortment of covers and original songs, each one better than the next. Before bursting into the honky tonk classic ‘The Whiskey Ain’t Working,’ he mentioned the grandeur and formality of the venue, and unceremoniously told the audience, ‘If You want a formal show, you’ve wasted your money.’ There is simultaneously an irreverence, typical of Stuart’s genre of country, alongside a pure reverence and respect for the music, and those that have come before him. He spoke of the need to ‘keep traditional country alive,’ before performing El Paso, a tribute to Grady Martin. Grady played guitar on Marty Robbins version of El Paso, and Stuart and the Superlatives were asked to perform it at the Country Music Hall of Fame medallion ceremony in 2015 when Grady was posthumously inducted into the prestigious institution. El Paso is not an easy song, there are close to 500 words, and the guitar part is infamously difficult, yet it was flawless. Perhaps the most striking thing about last nights concert was that every single member of the band had a chance to take to the lead microphone, it was not just a Marty Stuart show, it was The Fabulous Superlatives’ show. ‘Cousin Kenny’ Vaughan, lead guitarist, was the first to take to the mic. He thrilled the audience with ‘Country Music Got a Hold on Me,’ followed by possibly the only call-and-response rockabilly track ever to mention Kim Kardashian, called ‘Hot Like That.’ Next up was Professor Chris Scruggs, bass/guitar, and grandson of the late great Earl Scruggs, took the stage by himself, and performed the original ballad ‘Old Souls Like You and Me’ with only his acoustic guitar as accompaniment. ‘Handsome Harry’ Stinson, drums, performed a cover of Woodie Guthrie’s ‘Pretty Boy Floyd,’ and showed off his impressive vocal control and bluegrass tone. Each and every member of this band can hold their own, not only that, but they shine. I don’t like to give bands a five-star review, I feel like it makes me seem biased, however, I cannot give this performance anything less than five stars. This band are so incredibly talented, and although their talent shone as individuals, together they are greater than the sum of their parts. The sheer musicianship, three (sometimes four) part harmonies, impeccable choice of songs, and their contagious enthusiasm for country music erupts and flows throughout the audience, there simply is nothing to fault. If you see one band as part of Country Music Week, let it be this one, travel if you have to, but whatever you do, just go. Check out the rest of Country Music Week events here.